I have a confession: I used 1100 litres of water to make my breakfast today. It was nothing special, just a small glass of orange juice, a cup of coffee, two eggs, toast and two pieces of bacon. But it did take 1100 litres of water to grow and process the ingredients. That’s a whole lot of water considering the average bathtub only holds about 80 litres. Even after 20 years of covering environmental issues in two dozen countries I had no idea of the incredible amounts of water needed to grow food or make things. Now, after two years working on my book Your Water Footprint I’m still amazed the T-shirt I’m wearing needed a whopping 2500 litres to grow and process the cotton. Or that 140 litres was needed to grow and process the coffee beans to make my morning coffee. Since a litre of water weighs a kilogram, that’s 140 kilos of water, imagine having to haul that much in a bucket every morning! Researching all of this I soon realized we’re literally surrounded by a hidden world of water. Although we can’t see it, there is water in everything we eat, everything we use and buy. Almost anything you can think of – cars, furniture, books, dishes, TVs, highways, buildings, jewelry, toys and even electricity– would not exist without water. It’s no exaggeration to say water is far more valuable and useful than oil. Unfortunately, water is often taken for granted and undervalued, resulting widespread misuse and waste. The idea behind my book is to increase awareness of huge quantities of the hidden water our entire way of life depends on. Your Water Footprint uses colourful infographics to illustrate the size of the water footprints of a wide range things from shoes to whiskey. A water footprint is the amount of water ‘consumed’ to make, grow or produce something. I use the word consumed to make it clear this is water that can no longer be used for anything else. 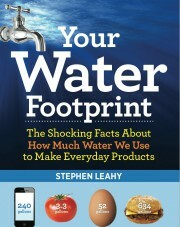 Water can often be cleaned or reused, so those amounts of water are not included in the water footprints in the book. For example, when you drink a half-litre of bottle water you’re actually consuming 5.5. litres. Why so much? Making the plastic bottle consumed 5 litres of water. After poring through many studies on water footprints, I was really surprised to see how tiny my direct use of water for drinking, cooking, showers and so on was by comparison. Each day the average North American uses 300 to 400 litres. (FYI: Flushing toilets is the biggest water daily use, not showers.) Now, 400 litres is not a trivial amount of water, and we can all get by using less by employing some water-savings tips. However, compared to the hidden water, also known as virtual water, that’s in the things we eat, wear and use for a day averages an incredible 7500 litres. That means our daily water footprint is almost 8,000 litres (direct + hidden freshwater use). Carrying all this water would be like trying to haul the weight of four mid-size cars every day. Water scarcity is a reality in much of the world. About 1.2 billion people live in areas with chronic scarcity, while two billion are affected by shortages every year. That’s two in seven people. And as the ongoing drought in California proves, water scarcity is increasing reality for many of us in the US and Canada. Water experts estimate that by 2025, three in five people may be living with water shortages. While low-flow shower heads and toilets are great water savers, the water footprint concept can lead to even bigger reductions in water consumption. If a family of four replaced beef with chicken in all their meals, they would reduce their water use an astonishing 900,0 00 litres a year. That’s enough to fill an Olympic-sized pool to a depth of two feet. 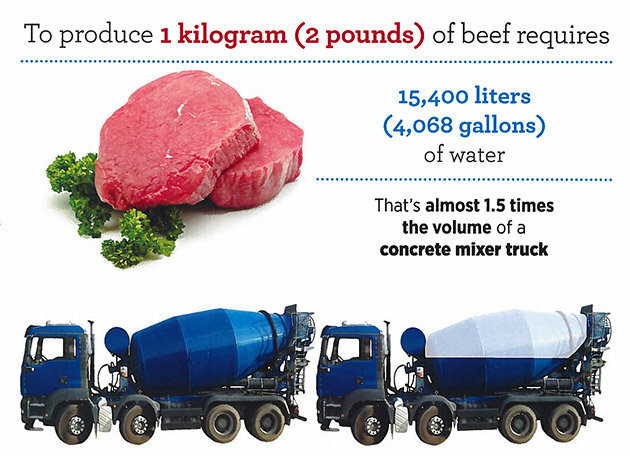 The reason is the water footprint of beef is four times larger than chicken. Vegetables have an even smaller water footprint. If the average family liked the idea of “Meatless Mondays,” they’d save 400,000 litres of water a year. My hope with Your Water Footprint is to give you enough information to make water-wise choices to reduce your water use which will help you save money, be prepared for shortages and ensure our children and grandchildren will have abundant fresh water. This is all about smart substitutions and changes, rather than sacrifice and self-denial. To do this we need to know how much we are currently using. We can’t make the water-wise choices unless we begin to see and understand the invisible ways in which we rely on water. This entry was posted in climate change, energy, environment, food, global warming, pollution, Water, water footprint and tagged beef, clothes, cotton, drought, electricity, Energy, Flood, food, hidden water, meat, virtual water, Water, water footprint, water scarcity, water shortage by Stephen. Bookmark the permalink.